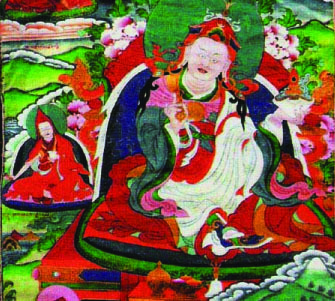 Tertön Rigdzin Düddul Dorje (Tib. གཏེར་སྟོན་རིག་འཛིན་བདུད་འདུལ་རྡོ་རྗེ་, Wyl. gter ston rig 'dzin bdud 'dul rdo rje) (1615-1672) was a nyingma tertön and one of the main student of Jatsön Nyingpo. In the middle of the 17th century, he played a critical role in re-strengthening the Katok Monastery lineage and its initial monastery which had fallen into disrepair. Rigdzin Düddul Dorje was born in the vicinity of the royal court of Derge, in Kham. Later in his life, Rigdzin Düddul Dorje was regarded as a reincarnation of Drokben Khye'u Chung Lotsawa. After the original Kathok Monastery fell into disrepair, Tertön Rigdzin Düddul Dorje built a new monastery in 1656. When the Qosot Mongols overran Central Tibet in the middle fo the 17th century, Jatsön Nyingpo appointed Rigdzin Düddul Dorje to convert the aboriginal tribes of the Yarlung Tsangpo (aka Brahmaputra) gorges to the Buddha’s teachings and open the way to the hidden land of Pemakö. You should go to Powo and devote yourself to the previously established practice; and at that point a prophecy will come to you, and you will have the opportune fortune [to find] a profound treasure work. Rigdzin Düddul Dorje followed the instructions of his master Jatsön Nyingpo and left Derge, in Kham, to move to the provinces of Central Tibet, and to the Southeastern regions of Kongpo and Powo. While Rigdzin Düddul Dorje journeyed to the kingdom of Powo, situated at the entrance to the vast wilderness of the Yarlung Tsangpo gorge of the hidden-land of Pemakö, he revealed a terma. According to local tradition, he mapped a circumambulatory pilgrimage path around Pemakö, called Padma-Sri. Right after that, when a route description for the sacred site Pemakö from the Powo Dungchü Lhakhang came to life in his hands, he took Rikden Nétso (Wyl. rigs ldan gnas mtsho) as his companion and proceeded with a large retinue of disciples to Pemakö. [There] he prepared a clarification of a temporary gate to the sacred site..
Taksham Nüden Dorje, who especially received the teachings related to Pemakö. Katok Gyalse Sönam Deutsen was recognized as an incarnation of Tertön Rigdzin Düddul Dorje. Being regarded as a reincarnation of Drokben Khye'u Chung Lotsawa, Rigdzin Düddul Dorje is counted among the previous incarnations of Dudjom Lingpa and Dudjom Rinpoche. Dudjom Rinpoche, The Nyingma School of Tibetan Buddhism, Its Fundamentals and History, trans. and ed. Gyurme Dorje (Boston: Wisdom, 1991), page 813-817. Ronis, Jann. “Bdud 'Dul Rdo Rje (1615-1672) and Rnying Ma Adaptations to the Era of the Fifth Dalai Lama.” In Power, Politics, and the Reinvention of Tradition: Tibet in the Seventeenth and Eighteenth Centuries, edited by Bryan J. Cuevas and Kurtis R. Schaeffer, 172-86. This page was last edited on 6 July 2018, at 22:33.